It's been an excellent day for fans of the Halloween franchise with the release of not one, but two lengthy trailers. The second trailer is the international version, which boasts an entirely different cut and offers a bunch of brand-new footage, including a tease of an unmasked Michael Myers, showing off the back of his head. While both trailers are pretty different from each other, they both share The Shape's path of destruction and give some sneak peeks at the battle between Laurie Strode and Myers. David Gordon Green's Halloween is only a few weeks away from hitting theaters and the studio has kicked the promotional campaign up a notch with the latest trailers. Michael Myers is on the hunt for Laurie Strode, and she is prepared for him, noting that she has prayed every day for 40 years that he would return so that she could kill him. Strode, who is played by Jamie Lee Curtis, is on the hunt this time around, instead of running from everything. Curtis says that new movie is "simple" and "terrifying," noting that it's very much like the first film. The international trailer for Halloween also shows off some new footage of a babysitter giving a child a pretty good jump scare as Michael Myers makes his way back to Laurie Strode. 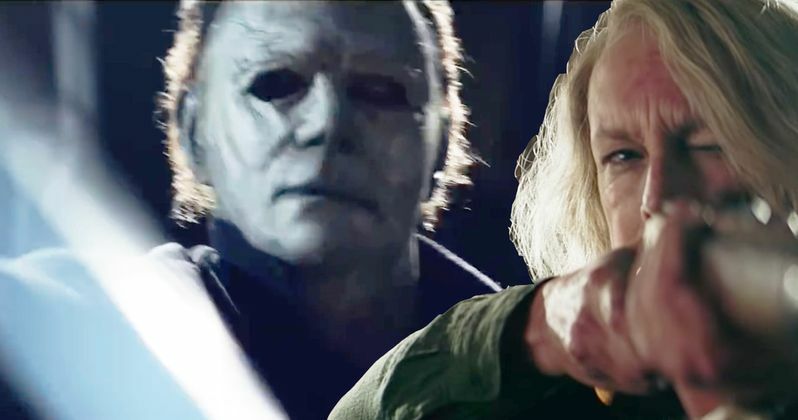 The battle between Laurie Strode and Michael Myers looks even more intense than it does in the North American trailer. Strode may think that she's prepared to take The Shape down after all of these years, but the international trailer definitely shows that Myers has some new tricks up his sleeve. Danny McBride and David Gordon Green decided to ditch all of the previous Halloween films when crafting the latest installment. They chose to make a direct sequel to John Carpenter's original, but they have included little tributes to the other installments in the series. An homage to Halloween III: Season of the Witch is clearly evident in the latest trailer, showing off three kids in masks, dressed as a witch, a pumpkin, and a skeleton. The addition of the masks from the third film in the franchise is a cool reference and an interesting choice since it's the only movie that doesn't feature Michael Myers. Fans of the Halloween franchise have been on the fence about David Gordon Green's film, but the two latest trailers should give some of those skeptics comfort. The movie looks like it has the feel of John Carpenter's original and it definitely pays tribute to other installments in the series. With that being said, fans will find out in a few weeks if Green and Danny McBride were able to pull everything off as well as to see if a sequel ends up getting the green light. For now, we wait, but at least we can watch the two new trailers. You can check out the international Halloween trailer below, provided by the Upcoming Horror Movies YouTube channel.